I'm Heidi from Smiley Guy Designs and I’m here with today’s inspiration post. 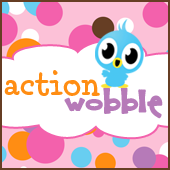 It's been a while since I've posted on the Action Wobble challenge blog and it sure feels great to be back. Today's card features some products from Reverse Confetti which is a new company I found recently. I used an Action Wobble on the main image and was actually able to snap a picture of the wobble in action. Not an easy thing to do I might add while holding a camera in one hand while trying to 'wobble' the image.